Architecture of Performance Measures – When Are There Enough Performance Indicators? If you are running a business, having a big set of performance measures is a good thing. But a set of measures by itself isn’t enough. Having performance measures is one side of the coin. The other side (and what counts) is the application of those measures for its fundamental purpose — that is, to improve business performance. Technological advancements in business analytics makes it much easier to collect and report data. This causes a tendency for business users to demand excessive numbers of performance indicators— in some cases, even more than needed to monitor, control and manage their business. Performance measures are worthless and counter productive unless used for a specific purpose such as to track work and achieve better results. When are there enough performance measures? This question can be answered only by you as users of information. Review what you have and analyze each performance measure. You’ll never know. You might have in excess of some types of measures and lacking others. Let’s understand the different types of performance measures. Performance measurement is the regular collection and reporting of data to track work produced and results achieved. Performance measures can be applied in any organization, regardless of size, type and structure. To illustrate the different types of performance measures and how they are used in different levels of the organization, please refer to the figure below. PLAN: Design or revise components to improve results. ACT: Adjust the plan based on results gathered during the check phase. When you talk about performance measurement, the most important element of the Deming circle is the “check” element. That’s where you apply performance measures, “check” or measure in order to “act” and change the “plan”. Consequently, you adjust what you “do” in execution. The nested Deming circles represent the levels of the organization and the different types of measures used at every level. The first circle denotes the corporate or strategic cycle. 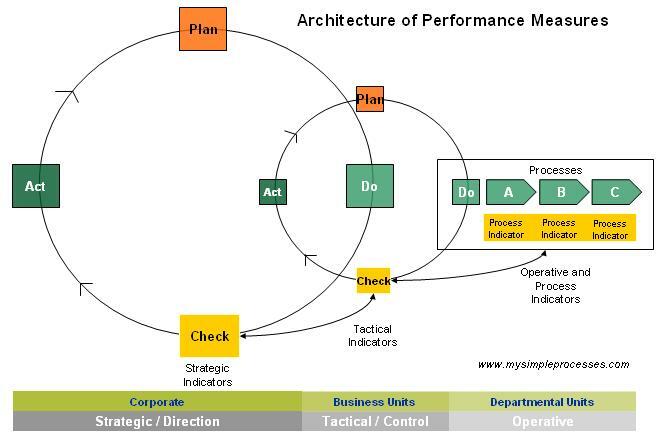 The performance measures in the “check” component in the strategic cycle are composed of strategic performance indicators. They are usually a high level aggregate of data consolidated in summary, graphs and dashboards. Performance measures at this level are usually a small set of key performance indicators selected by top management. The second circle represents the business unit or tactical cycle. The measures in the “check’ component of the tactical cycle are composed of tactical performance indicators. They are usually a drill-down of the strategic measures and used to manage and control the business operations. Performance measures at this level are usually a small set of key performance indicators selected by business unit management. Tactical measures are an important link to strategic and operative measures. The last level is made of the process indicators or operative measures. They are measures that are embedded in each of the end-to-end processes, within or across departmental boundaries. These are the lowest level measure use to track work on a daily basis to improve process efficiency and performance. Now that you know the different types of performance measures depending on different levels of the organization, examine your existing metrics. Do you think you have the right quantity and quality of performance measures at every level? I have gained some extra pounds since the beginning of this year and this has hurt my right ankle a bit. For the past 3 months, I have been planning but failing to have a continuous physical regimen that will bring my body to a comfortable weight …until I found my new buddy – my Wii Fit Plus! It has been more than a week of Wii Fit training and I have not missed a day of fun workout. I definitely feel much better now. There is no hidden secret why Wii Fit has been so effective. What keep me coming back are the daily body tests that allows me to monitor my progress as compared to the goal that I set. The Wii Fit performance dashboards are amazing control measures! If performance measures are so effective in driving personal results, how does it relate to business? This is what this article is about — my reflections on the business of my Wii Fit Plus experience. 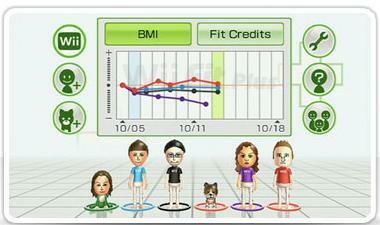 When I first played Wii Fit Plus, I was asked to set a goal for myself concerning my Body Mass Index (BMI). So I set where I’d like to end up — including the timeframe. Goals and graphs appear on the calendar so it’s easy to visually see my progress towards my goal. Another fun thing was receiving feedback from my personal Wii trainer – giving me pointers and encouraging me towards meeting my goals. In business, this can be likened to the combination of your strategic objectives setting and performance management system. Normally, you start the year off with a planning session. This is the time when you lay out your strategic plans and goals. Once you have those strategic plans, they are translated to tactical objectives and then into operational goals. Most organizations have multiple business units, divisions and departments, each with their own responsibilities, processes and applications. Those tactical and operational goals trickle downward to individual employees. As you can imagine, in such a complex organization, the question is: How can you monitor and measure your progress towards the organization’s business goals? How do you encourage each department to continue working towards meeting those goals? Wii Fit Plus provided simple graphs detailing my progress with my BMI, weight, Wii Fit Age and Fit Credits, as well as a calendar to monitor my training and goals. I was able to compare the calendar and graphs with my wife’s on the same Wii Fit Plus game, so both of us got involved. Monitor – supervise key processes using key performance indicators that prompt alerts when potential deviation and problems arises. Evaluate – analyze the possible causes of the problem by exploring relevant and timely information from different levels and multiple perspectives. Manage – direct organization and processes to improve decision, optimize performance, refine strategy and steer the business in the right direction. The best way that executives can drive their business today is through an interactive dashboard that contains both historic and forward looking measures. Using performance dashboards, executives can view and analyze information about business results and the activities they manage. For middle managers, it will help them view departmental business metrics at a glance and drill down quickly to smaller segments of actionable information. 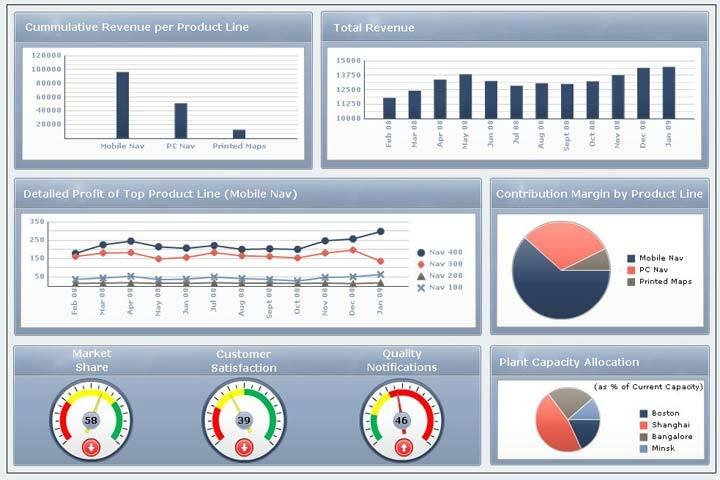 Business Intelligence and Performance Dashboards are powerful agents of change. They help business reach their goals. This is much like how my Wii Plus charts has helped me achieve my personal targets! Photo courtesy of Wii Fit Plus and SAP Business Suite.